I go to New Gen so much that I could practically write a blog about just New Gen– so it’s funny that I haven’t written it up until now. It’s a neighbourhood favourite because it strikes the right balance between quality and price– along with pretty good service and the convenience of being open pretty much whenever I’m hungry. As is typical of many Japanese restaurants, you start with either tea or water (both, for me). After you order you usually get served a complimentary miso soup (a salty broth made with soybean paste with tofu and seaweed bits in it — sounds gross to a first-timer but it grows on you) — drink it right from the bowl! Then occasionally you’ll get a complimentary salad as well. After you eat enough to be stuffed, you’ll almost always get a choice of complimentary ice cream (often mango, red bean, green tea, black sesame, or vanilla– green tea is my personal favourite). The servers work as a team and they’re usually pretty good at being around when you need a refill or have a question. They’re not always the most personable but they’re usually efficient, and they’ve never messed up an order yet. 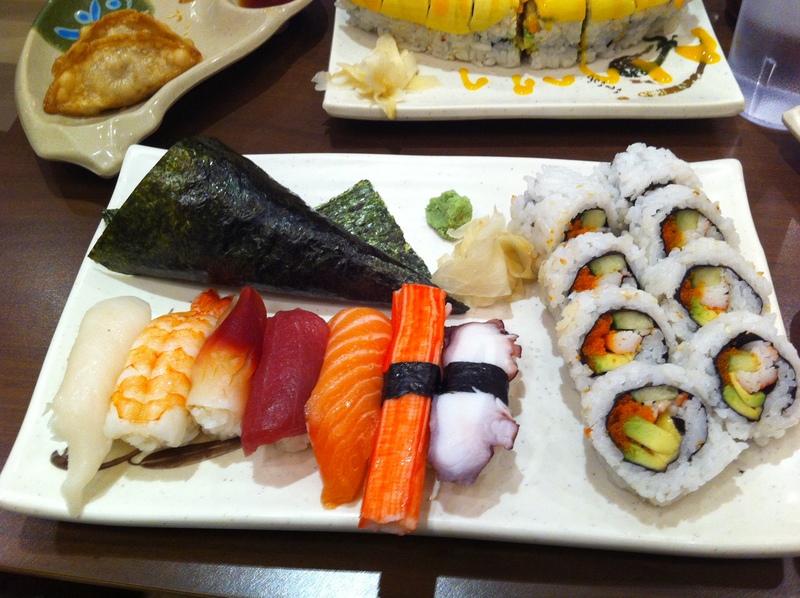 In terms of the food, we have mostly tried the Bento Boxes (and therefore all the components) and the sushi/sashimi– all have which have been edible and even quite delicious at times. Their Bento boxes (the equivalent of a Japanese “combo”) include items such as stir-fried veggies/beef/chicken/salmon/pork (teriyaki), deep-fried dumplings (gyoza), rice, lightly battered deep-fried veggies and/or shrimp (tempura) and a couple of little bites of sushi. These are consistently good and very filling — plus to the novice diner there’s not a lot in there that is likely to be totally foreign to your taste buds. All of the elements are acceptably tasty: the tempura can be just a tiny bit greasy at times but it’s a mix of veggies; the stir-fried stuff is usually pretty tender and there’s a lot of it; the gyoza are fine in the box but I wouldn’t order them separately. Our Bento Box days are behind us now and we pretty much stick with maki (what most people think of as “sushi”– the rolls cut into bite-sized pieces), nigiri (the raw fish on rice), and sashimi (just the raw fish– not technically sushi because the “sushi” is the rice). They serve the above with soy sauce, wasabi (the spicy green horseradish paste-I mix it in with my soy sauce in the little bowl to dilute it and give my maki a delicate dip), and yellow ginger (which I admit to putting directly on my maki rolls- I love the taste). The rice isn’t usually mushy or over/underseasoned, the fish is reasonably fresh, and there are lots of options. I consider it a good sign that I have yet to have any major digestive issues after eating at New Gen. Overall, New Gen is a neighbourhood staple for dining that is filling, feels reasonably healthy, and is easy on the wallet. There’s a lot of sushi places in the neighbourhood and I haven’t found another one that can equal New Gen in terms of value and food quality. 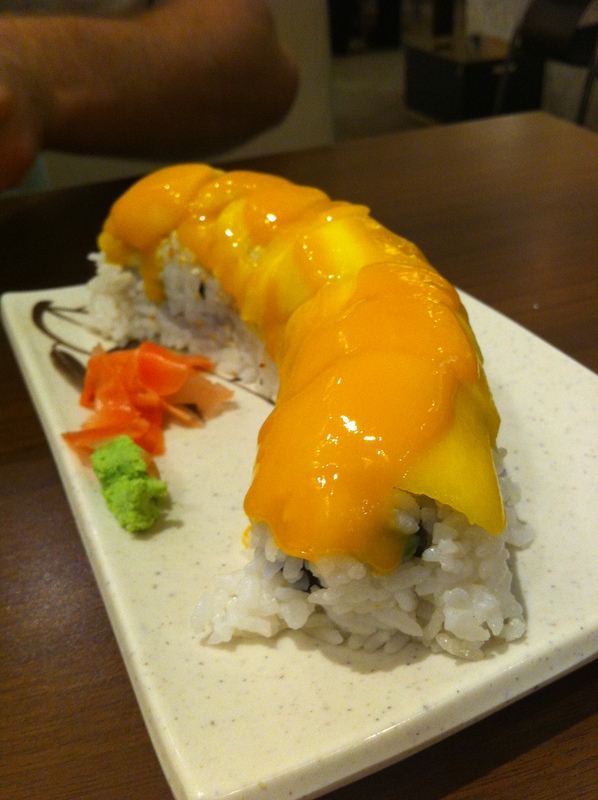 Mango Fushion— This is a vegetarian roll with tempura yam and avocado in the middle, topped with mango and mango sauce. I skip the mango sauce because it tastes like perfume to me. This is my favourite New Gen roll. 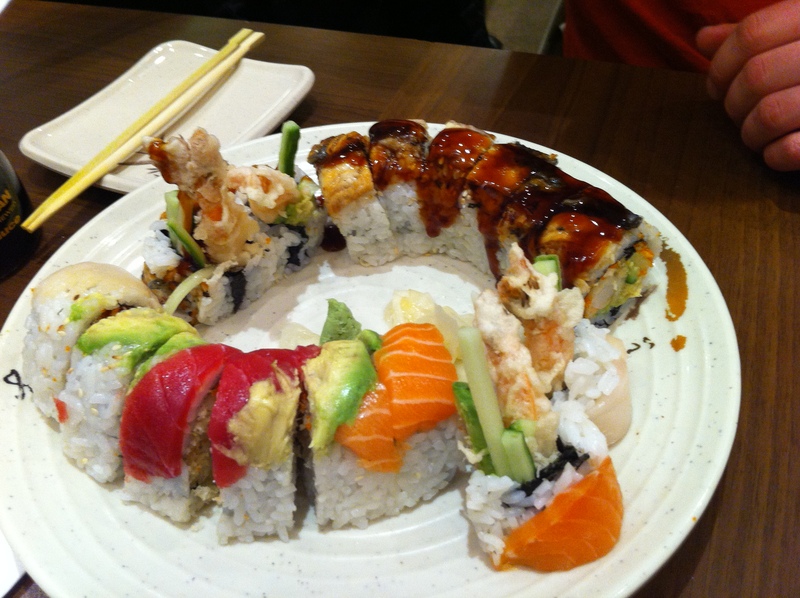 Rainbow Dragon— Colourful and fun, this roll is striped with raw salmon, tuna, and red snapper (tai) on top and filled with avocado and tempura shrimp. My partner’s favourite. 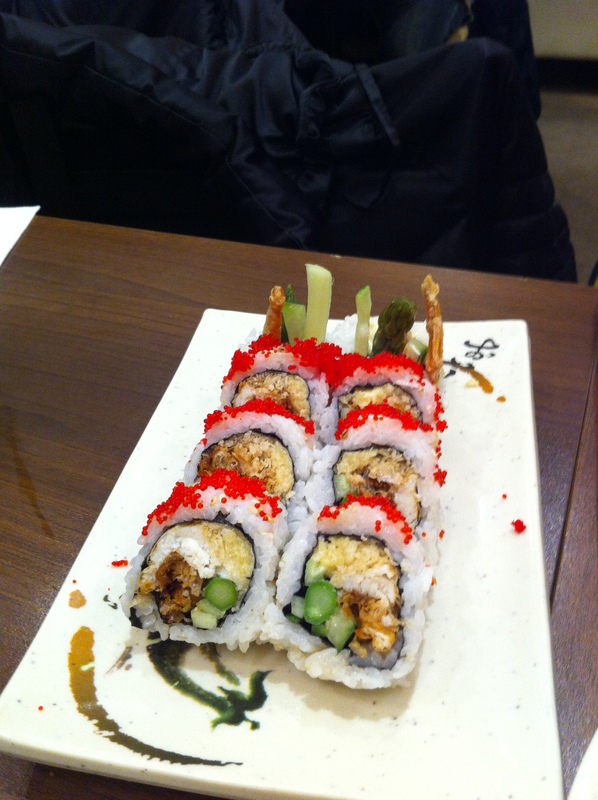 Dynamite– Another classic- this is similar to the Rainbow Dragon but without the raw fish on top and with cucumber on the inside. 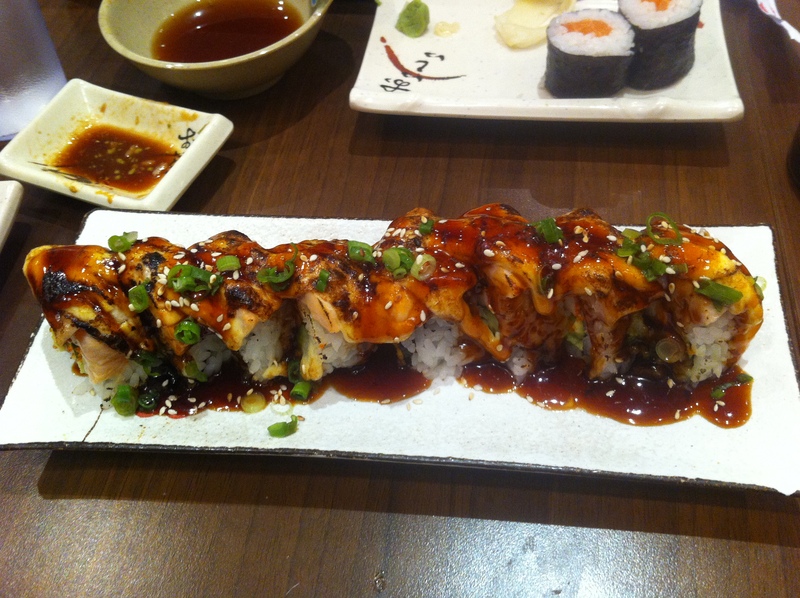 Spicy Salmon/Tuna Maki– This is one of my favourite rolls at other Japanese restaurants, but at New Gen it falls flat for me. The tempura bits (the crunchy part) aren’t light and crispy enough and I’m not a big fan of the spicy mayo. Crunch Maki- Same deal as Spicy Salmon/Tuna, but with plain mayo instead of spicy and avocado instead of cucumber. Without the mayo it was pretty good, but still not great. 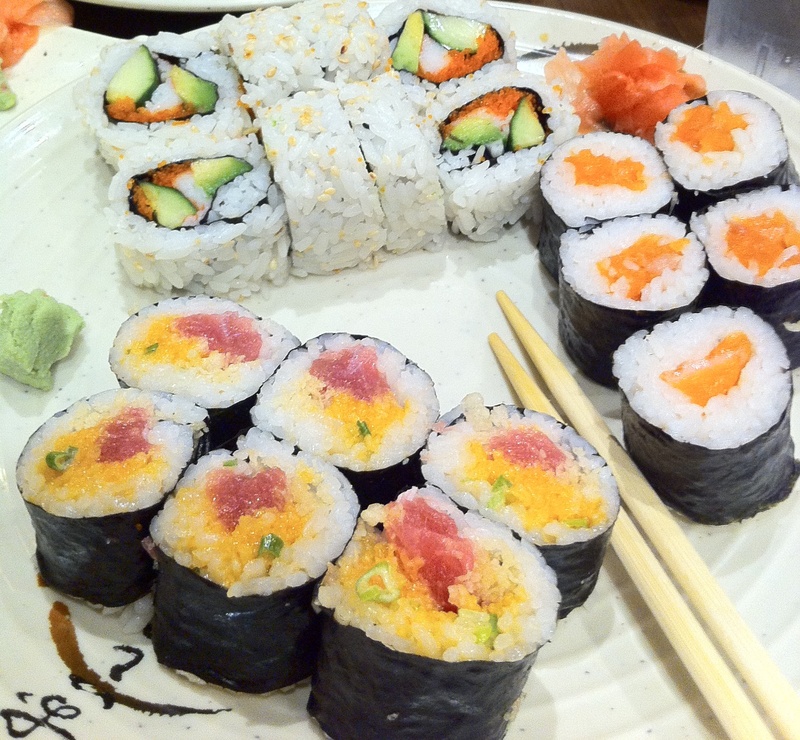 Plain Fish-Anything Maki – The plain salmon or tuna is usually too simple for me– but it’s consistently pretty good. Grilled-Anything Maki– Maybe I just like my sushi meat cold, but any of the BBQ stuff I don’t like as much. And when it’s by itself it’s just really plain– although it’s probably a safe bet for a sushi first-timer…you’ve had rice and grilled meat before, right? Unagi Bonito Maki – The mayo and bonito flakes (which were also present on the Takoyaki that we had such a bad experience with) just ruined this roll for us. The BBQ Eel is pretty good, though! This entry was posted in Dine Under $50, Japanese, Lunch, Uncategorized and tagged bento box, gyoza, maki, nigiri, sashimi, sushi, tempura, teriyaki. Bookmark the permalink.